U-848 is bracketed by five depth charges dropped by United States Navy PB4Y-1 Privateer "107-B-4" flown by Lieutenant Samuel K. Taylor of Patrol Bombing Squadron VB-107. Lieutenant Taylor attacked from seventy feet (21 meters) at 225 knots (415 kilometers per hour). This ninth attack in one day on U-848 was followed by another run by Lieutenant Taylor, who destroyed the U-Boat with two depth charges. U-848, a Type IXd2 U-Boat, was commissioned on February 20, 1943 under the command of Korvettenkapitan Wilhelm Rollman (August 5, 1907 - November 5, 1943). Rollman was a U-Boat ace who sank over 100,000 tons while the commander of U-34. Ordered to the Far East to join the "Monsoon" wolfpack operating from Japanese bases in Indonesia for war patrols in the Indian Ocean, U-848 sank the unescorted steamship Baron Semple, a British freighter, near Ascesion Island in the South Atlantic on November 2, 1943. Master Philip Jarvis Carnie and sixty-one crewmembers were killed. Word of the sinking did not reach VB-107 before they attacked U-848. VB-107 was ordered to Ascension Island in September 1943; they conducted antisubmarine patrols in conjunction with United States Army Air Force North American B-25C Mitchells of the 1st Composite Squadron. Lieutenant Charles A. Baldwin's "107-B-12" was five hours into their patrol on November 5, 1943 when they spotted U-848 on the surface. 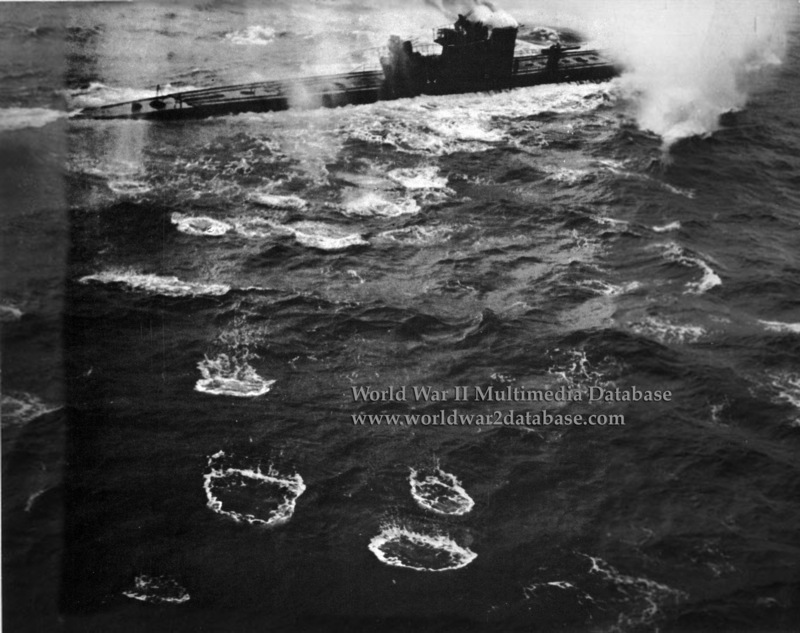 In two attack runs they were able to disable the U-Boat's ability to submerge and directed subsequent aircraft to the target. Lieutenant William R. Ford, flying "107-B-4" joined Lieutenant Baldwin; while he attacked in a strafing run, Ford dropped depth charges fifty feet from U-848 in two separate runs. Both planes reported heavy antiaircraft fire. Ford called for more help and returned to Ascension Island. Lieutenant William E. Hill left Ascension at 1209 Hours in "107-B-8" and arrived at U-848's location at 1235. His attack was disrupted when U-848 set his number two engine on fire; his depth charges landed 100 feet (30 meters) away from the sub. Two B-25Cs flown by Captain Philip Main and Major R. T. Akins made attack runs with 500-pound (226.8-kilogram) demolition bombs after that but did not score any hits. Captain Main's plane suffered damage to its hydraulic system. Lieutenant Taylor, who replaced Lieutenant Ford in 107-B-4, took off from Ascension at 1513 Hours and sighted U-848 at 1655. The first run for Lieutenant Taylor and his crew, shown here, straddled the conning tower with the third and fourth bombs. Coming around again, Taylor destroyed U-848 on the tenth attack with four Mark 47 depth charges dropped from fifty feet (15 meters) at 1900 Hours. In his after-action report Taylor wrote "After pulling out of dive and around in position to see the submarine, it appeared to be settling straight down, until suddenly from the conning tower forward, it shot up in the air, and then there was a terrific cone shaped explosion, coming from and surrounding the entire sub, which rose high in the air. As this subsided everything seemed to be swallowed by the sea." Taylor and his crew saw twenty or thirty survivors in the water. "107-B-4" dropped a life raft and an Army Consolidated OA-10 Catalina dropped three. Taylor attempted to divert HMS Fort Cumberland to the survivors' location, but the ship never arrived. A month later, on December 3, 1943, USS Marblehead (CL-12) rescued Oberbootsmann (literally Upper Boatswain, but comparable to Senior Petty Officer) Hans Schade (1913-1943); he was in a United States Army life raft for twenty-eight days. He entered the military hospital at Recife, Brazil on December 4 and died the next day. Schade was the only one found of sixty-three crewmembers of U-848. Taylor and Baldwin received Distinguished Flying Crosses personally from Eleanor Roosevelt at Natal, Brazil on March 16, 1944.